SERENA, Mable and Carmen are young aspiring dancers. They learned perseverance in the journey to realise their dreams. Leah Sams, Tunku Martika Tunku Mu’tamir and Sofia Tengku Daud identify with the characters from the musical Fame. After all, the Alice Smith School students themselves are polishing their skills in the performing arts. 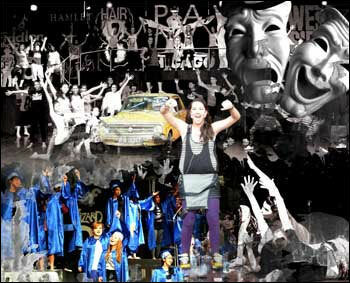 The school’s recent production of Fame was a hit. With sell-out performances for four nights, the revival of the musical attracted fans, both young and old. Secondary campus drama teacher Melissa Bicknell directed more than 50 students aged 13 to 18 who made up the cast and crew. They were auditioned in September. Fame is about a group of vibrant, energetic young people auditioning for the chance to study at the famous New York High School of Performing Arts. Once accepted, the students are greeted by Miss Sherman, their English teacher, who warns them that it takes a lot more than dreams to succeed. One of the most successful musicals with productions in nearly 25 countries worldwide, Fame touches on many issues that confront young people today including prejudice, identity, self-worth and literacy. For fans of Fame at the recent event, the songs got their feet tapping to the tunes instantly, bringing back fond memories for them. Bicknell says: “This is one of the most challenging musicals to put together. The dance, music and vocal arrangements are far more complex. “With the development of drama at the school and its growth as a subject, the students are better skilled as performers and rose to the challenge.” To give the performance the extra edge, students had the chance to work with professional musicians and a choreographer for the first time. Sams, Tunku Martika and Sofia agreed they could relate easily to their characters and have grown in many aspects. Though practices were intense, they had a lot of fun rehearsing their parts.